You may have heard that we’re running a B&B for insects down here. 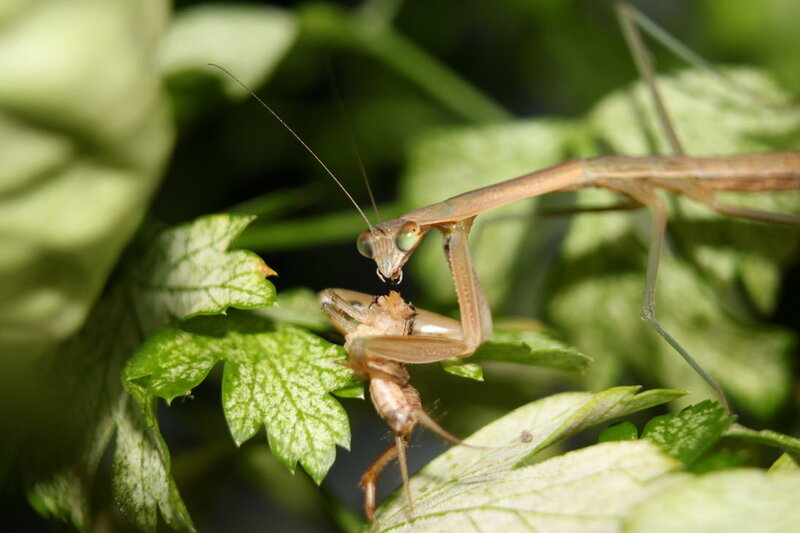 I mean, we currently house a mantis, a butterfly, a dozen crickets, 5 superworms, and a fluxuating number of black flies and aphids. I can see how you could get confused. Most of those are food for the other animals in the house. The only animals invited here to stay and not get eaten are the ones that will shortly be released to the outdoors to help out the garden. And we all know, Mr. Stinkbug, you are not going to be any help in the garden. So, please, understand that we will not tolerate you here, hanging out by the kitchen sink. Against my better judgement, we’re going to try planting corn this year! It was an utter failure when I was a kid, but I am in Maryland, and corn is supposed to grow really well here. Of course, I’m going to have the bare minimum amount of corn to really expect it to fertilize well, which might be an issue. Another problem is that we’re in a windy area, and the wind might blow all the pollen away before it can fertilize. We did have some fertilization issues last year in the cucumbers and squash, but that might be because of their varieties. Not only are we planting corn, but we’re using the three sisters method. It was the way many Native American tribes planted their crops. It involves three different plant types: corn (maize, really), squash, and beans. They are naturally complimentary crops — the corn makes a great trellis for the beans to climb and the beans in turn help stabilize the corn against the wind. Beans also fix nitrogen back into the soil, helping to fertilize the other plants. The squash act as a ground cover, blocking weeds from growing and shading the soil to help the soil keep from drying out as quickly. If you plant a spiny squash, it can also discourage predators. I read a nearly 100-year-old account of a Native American woman’s recollections of how she and her tribe farmed, using this method in Buffalo Bird Woman’s Garden. 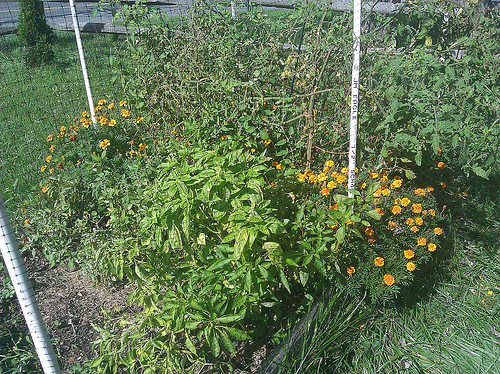 For information about planting your own garden with the Three Sisters method, check out Renee’s Garden. A Cherokee tribe in Alabama posted some three sisters myths online. The farmer’s almanac has more information about companion planting. 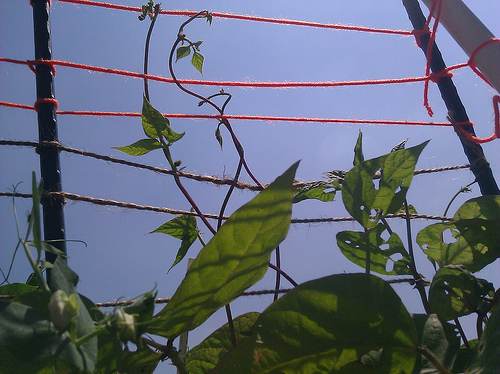 Some of these most gardeners are familiar with, such as planting basil and marigolds with tomatoes. 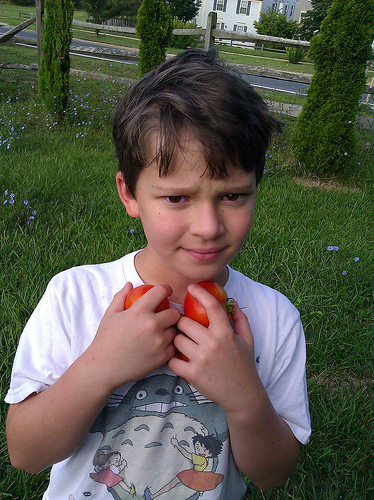 There are also plants that need to planted away from each other, such an onions and beans. 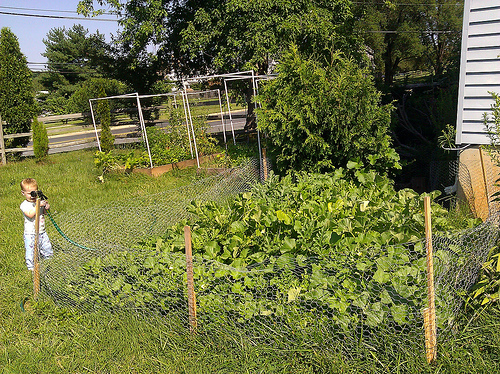 My plan is to plant two 4′ x 4′ raised beds. One has early varieties of corn, squash, and beans, the other will have varieties the mature in a more regular length of time. If you divide the beds into 1′ x 1′ squares, each has 16 squares. I plan on putting five squash plants in five squares (the corners and center). The other 11 squares will each get 2-3 corn plants and 2-3 bean plants. 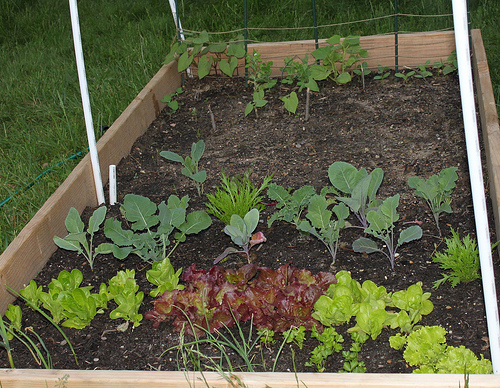 If you’ve never heard of square foot gardening, this can seem awfully close, but the “experts” indicate that it does actually work, if you can water everything enough and fertilize often. That’s where the compost pile and the beans’ ability to fix nitrogen really comes in handy. Science — Life cycle of seeds, soil science, nutrition. Social studies — Native American culture, traditions, stories. Math — building the raised beds requires a lot of measuring and engineering, volume calculations to determine how many bags of dirt to buy, figuring out how many seeds to grow, timing everything just right, writing and reading charts of planting, and more! Wish us luck — we barely had winter this year, which is a double edged sword. I think we’ll get to start the garden 1-2 months earlier than last year, and get some nice cool weather for the broccoli and such, but the bugs will probably be overwhelming. But the kids are pretty excited! 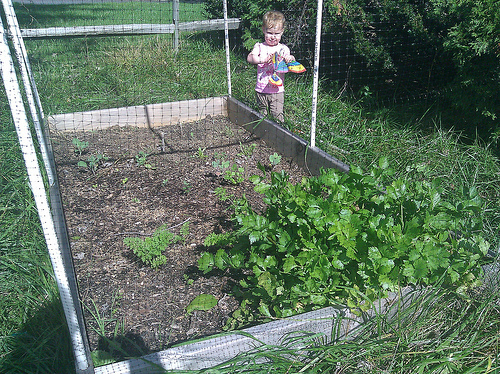 Growing food was really difficult in 2011 in Maryland. The weather was brutal. A late frost, an early summer, a hot summer, monsoon-like rains, the edge of a hurricane right when I planted my fall seeds, and tons of bugs. And deer. And rodents. Hopefully this year will be better. Here are all the things I tried to grow, and how they did. A future post will show what I’m planting this year, and hopefully I’ll even get a garden map and planting schedule up! Stuttgarter Onion — did wonderful! So tasty. Planted 15, wouldn’t mind more. planted about 3 dozen over the winter, ready to come out in March. Green onion — I hope to get these to grow better this year. Purple Broccoli, Romanesco, Collards, Cauliflower — Managed to transplant two of each. No idea which they were. Got no flowers on any of them and never did manage to figure out which was which. The very brief spring was not so good for them, though they all made a great shade for the lettuce. Kale — didn’t grow very well. Did over winter, even when it was hit by a hurricane as a seed and then ignored for months. Going forward, I think I need to do better than throwing all the plants in the ground while trying to beat a fast approaching thunderstorm! Then maybe I’ll know which is which. 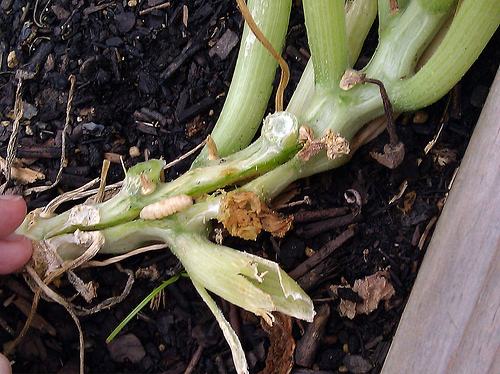 Celery — grew all year through winter! Strong taste, but nice. Kept growing. Planted 18 or so. Always had enough to give away. Since it was so successful, I’m going to grow Fennel in 2012! Snow Peas — Wish they weren’t dwarf plants. Didn’t do so great, would have loved more. Purple Pole Beans and Dragontongue Bush Beans — had a horrible bean beetle infestation. They didn’t taste that great, either. Fish Peppers — fun, but as it turns out I never cook with peppers I grow myself. Pretty. 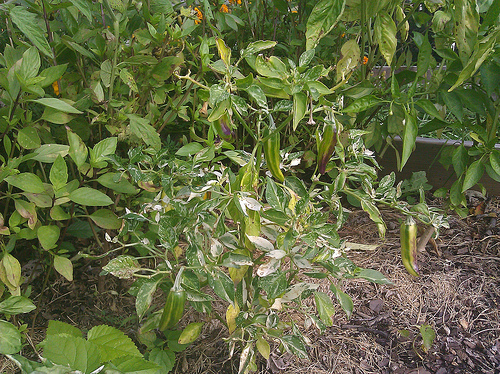 Anaheim Peppers– never managed to do much with them. Didn’t have much taste. Probably bad soil for them. Tomato Lemon — Out of three plants, I got 2 tomatoes. They were lovely, but it couldn’t handle the summer heat at all. Tomato Red Star — got maybe a dozen. Very tasty, but couldn’t handle summer heat. I’m going with a different tomato variety, plus I’m going to make sure the soil is balanced and isn’t just growing greens instead of fruits. Hopefully more steady, deeper watering will help, too. Beets — Did okay. Want more. Beets are tasty. but deeper.Tarragon — decently well. Oregano — was ok, I guess. Thai Basil — spectacular! Grow a ton. Make pesto. Give to everyone. Happy happy happy. Lets make Pho. Cilantro — planted too late, all got too hot. Muskmelon — most were eaten by some tiny rodent and never got ripe enough. taste that again, I’m willing to deal with losing the other 20 melons. Nasturtium — only had one actually grow. It was weird. I think it was just too crazy hot this year. Marigold — went absolutely crazy. 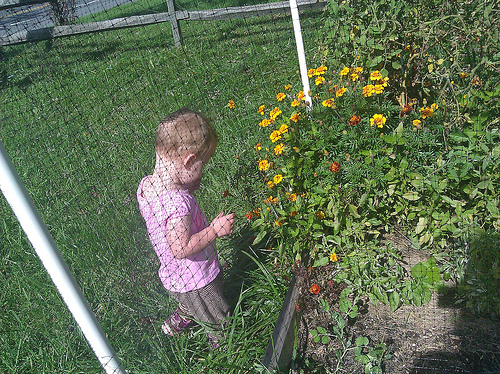 The baby picked 2 dozen flowers every day. Snap dragon — I have no idea where the kids planted them. They either didn’t get water or got mowed down.